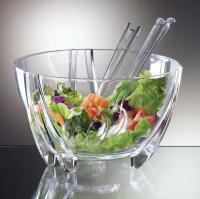 Acrylic Salad bowl with vented ice chamber stand plus salad servers that hook on rim. 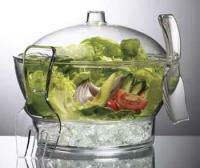 Keeps salads or fruit chilled and fresh. Fill vented stand with cubed or crushed ice to keep salads chilled and fresh. Dome lid keeps cold air in and bugs out. 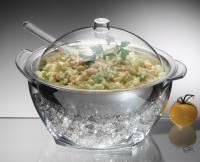 Includes attractive salad servers which hook onto the bowl's rim. Crystal clear acrylic is break resistant and shatterproof. Vented grate at bottom of main bowl also acts as a functional drainer to keep salad form getting soggy at bottom. 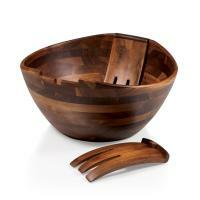 Perfect for all entertaining, both indoors and outdoors. Top rack dishwasher safe. Also use as an attractive fruit keeper with vented dome in place (no ice). 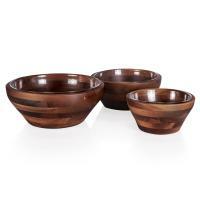 Fruit will ripen more perfectly and stay beatifully fresh longer than with ordinary fruit bowls. Hand-washing recommended. BPA Free.